Like the Wikipedia description says, I too discovered them through the Buddha Bar compilation series. 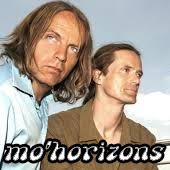 Mo’ Horizons is a duo of DJs from Hannover, Germany. Their music can be described as a mixture of downtempo, acid-jazz, nu jazz, soul, funk, dub, trip hop, big beat, bossa nova, boogaloo and drum’n’bass. They first came to prominence on various compilation albums, including the Buddha Bar series. They are known for their extensive use of sampling and modern production techniques in Latin jazz. Also known for recording a Portuguese version of a classic hit Hit The Road Jack.